Home >> Blog >> TREES! 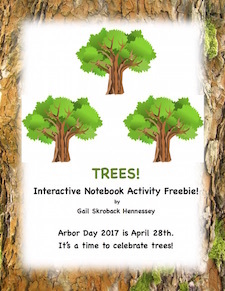 Free Interactive Notebook Activity for Around Arbor Day! TREES! Free Interactive Notebook Activity for Around Arbor Day! Click here for a free downloadable version. Arbor Day 2017 is April 28th. It’s a time to celebrate trees! The Botanical Gardens Conservation International announced that there are 60,065 different species of trees in the world (2017). The most endangered tree species according to the Botanical Gardens Conservation International is the karma figs. Found in the country of Tanzania, there are only six trees left. The tallest tree in the world is the Hyperion. The tree is 379.4 ft (115.6 m) tall and is located in California’s Redwood National and State Parks. The tree is taller than the Statue of Liberty (305.6 ft or 93.1 m) and the famous Big Ben (316 ft or 96 m) found in London, England. The largest tree in the world is the General Sherman. The giant sequoia stands 275 ft (or 83.8 m). Twenty people holding hands would be needed to circle the base of this tree! For many years, the oldest individual tree in the world has been a bristlecone pine named Methuselah. Its exact location is a secret but it is located somewhere in the White Mountains of California. It is estimated to be about 4,848 years old. In 2013, another bristlecone was found to be about 5,066 years old. This tree may now be the world’s oldest tree. The unnamed tree is located in the same forest. What would YOU name the tree? There is clonal tree in the country of Norway which has a root system estimated to be about 9,552 years old! It is called Old Tjikko. A clonal tree grows when their branches touch the ground and start new roots. The beautiful cherry blossom trees, found in Washington, D.C., were a gift from the people of Japan. Back in 1912, 3,000 trees were gifted by the mayor of Japan. Interestingly, in 1981, the United States gifted cuttings of some of the cherry blossom trees back to the people of Japan, after many of their trees were destroyed in a flood. Did you know that Guinness World Records says the manchineel tree is the “most dangerous tree” in the world? Just getting the sap of the tree on your skin can cause blisters. Getting the sap in your eye could actually cause blindness! This tree is found in tropical regions of North and South America. There is a tree called the Great Banyan Tree, found in the country of India that is called the “widest tree in the world.” If you look at the “tree” it looks like a forest as the “tree” covers 3.5 sq. acres of land in the Acharya Jagadish Chandra Bose Indian Botanic Garden. Its branches reach the ground and sprout new growth. Is the Banyan tree a “clonal tree”? Some people like to grow trees in a small dish. Called bonsai, the word means “tree in tray”. Growing living trees in this way is an art form from Japan. China also developed a similar type of art, too. What do you think these quotes mean? Illustrate on of the quotes. List seven products we get from trees. Write a diary entry about a day you took a walk into the woods. What did you see? Hear? Smell? Feel? Draw a picture of a tree. Write three ways in which trees are important. Have students learn about bonsai trees with this reading passage. Write 4 facts learned. Show students the Great Banyan Tree. Write a poem about the tree. Have students illustrate one of the Did You Know? facts. Learn about the history of Arbor Day and all about trees with this web quest. There are 11 web questions, a Did You Know? 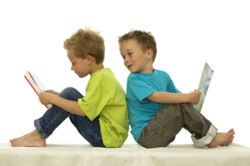 section, comprehension questions and a teacher section with answer keys, additional links and lots more. This could also be something to use with EARTH DAY, when you are studying TREES and, of, course, for ARBOR DAY! A Biologist and marine zoologist, Rachel Carson’s books shared her love of nature, especially the ocean and its inhabitants. Her book, Silent Spring, sparked concern in how chemical pesticides were harming our environment. Carson helped to start the environmental movement in our country, which led to the creation of the U.S. Environmental Protection Agency. This Reader's Theater Script on Rachel Carson could be used as a STEM biography any time of year or especially during the time of Earth Day.